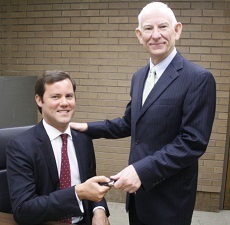 MARION — Brandon J. Zanotti was appointed Williamson County state’s attorney during a special meeting of the Williamson County Board on Monday. Zanotti, a Johnston City native, will replace longtime state’s attorney Charles Garnati, who, citing health reasons, announced last week he would leave office Monday, about two years into his eighth consecutive term in office. Zanotti was Garnati’s choice as his successor in office and he made the case for Zanotti’s appointment before county board chairman Ron Ellis, whose job it was to nominate a candidate for the office. The job, Garnati said, requires a sense of fairness and justice, integrity, intelligence, common sense and the ability to work well with others, qualities he said he observed in Zanotti. While the nomination was Ellis’ to make, he accepted Garnati’s recommendation as well as that of Williamson County Democrat Central Party Chairman Jim Kirkpatrick, who said he supported Garnati’s recommendation. “It’s been a tradition in Williamson County for over the last half-century that when an officeholder either resigns or retires that he play a leading role in filling that position. Further, Mr. Garnati has been state’s attorney for over 30 years, is well-respected and knows the type of person he feels will best fill this position. I give my full support to Chuck’s recommendation,” Kirkpatrick said. The county board voted to appoint Zanotti, 32, upon Ellis’ nomination and Zanotti was sworn in shortly after in a ceremony at the courthouse. Zanotti, who earned an undergraduate degree from SIU and his juris doctorate from Washington University School of Law in St. Louis, was previously an arbitrator with the Illinois Workers’ Compensation Commission and an attorney with the firm of Feirich/Mager/Green/Ryan. He also served as a congressional clerk to Sen. Richard Durbin in Washington, D.C. and clerked for Judge Joseph M. Leberman in the First Judicial Circuit. He said he was honored and humbled to follow Garnati into office. His immediate plans include meeting with staff and reviewing cases, including several pending murder prosecutions. “I’m very excited to start work right now,” he said.